It amazes me just how diverse games can be. From board games to card games and everything in-between, there's just so much going on in the world of games. Every game as the potential to bring something new to the gaming world - even the seemingly "simple" games out there. Splendor is essentially a card game that was very, very surprising for me. Initially unassuming and with a very simple game mechanic at its core, this card game is one of my favorite games discovered this year. I think the only thing that it has going against it is the fact that it is limited to a maximum of 4 players. Games like this really show that you don't need to make a game to be overly complicated in terms of rules and moving pieces. Some of the simplest games are the best at driving true strategic game play and some pretty memorable gaming. And that's what Splendor brings to the table for any gaming group. A brilliant experience contained in a rather small package. Synopsis: Splendor is a card game created by Marc André. It supports 2-4 players and in my experience it typically results in very silent, focused game sessions. In Splendor, players are merchants trying to buy gem mines and such in order to become the most prestigious among their peers. These are represented by the various cards that match the different colors of gems. The end goal is to have 15 or more Prestige Points in order to win. Every turn, players can either collect chips (gems), buy cards in play or reserve a card for later purchase. There are no ways to perform multiple actions in a turn, so every move matters. When you collect chips, you can either get 3 gems, all of different colors, or 2 gems of a single color, assuming that there are at least 4 chips left in the pile. The main benefit of purchasing cards is that each card acts as a discount for future purchases. So if the card represents 1 diamond (white), then future purchases will always cost one diamond less. And given the limited number of chips in play, these cards are going to be vital to increasing your purchasing power in order to get more expensive gem cards. And given three different tiers of cards with increasing cost values but also additional Prestige Points, you'll need to keep focused in order to get more cards. An additional game mechanic involves nobles that will also be part of the game. Each noble has an associated gem requirement (typically 3 gems of three different colors or 4 gems of two different colors) and each is worth 3 Prestige Points. When your collected cards meet the requirements for a noble, the noble will choose to stay with you at the end of that turn, thus giving you more points. So you can imagine players all racing to get the attention of the nobles in order to get an edge in winning the game. Or other players focus on buying the higher value cards since they're worth higher values of Prestige Points outright. The game supports a variety of play styles and strategies and no two games play out the same way. That's all part of the brilliance of this game despite such a simple set of rules. On a side note, I have to give some major praise to the creators for the decision what materials to use for the chips that represent the gems. These things have some serious weight and are a delight to play with. They're actually heavier than most standard poker chips, which make them feel more valuable somehow even though it's just part of the game's currency. 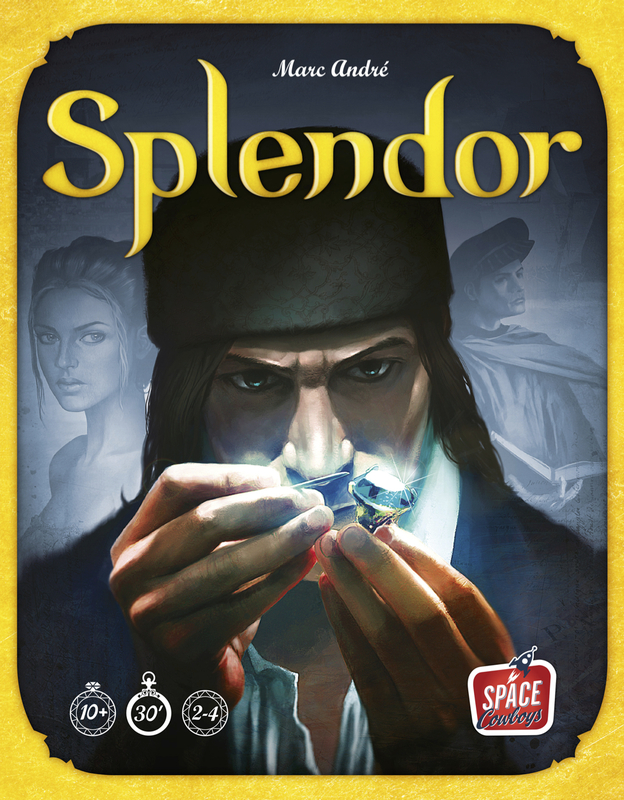 Splendor is a sheer delight and a great strategic experience for both new and old players alike. It's pretty easy to teach but you'll never stop trying to master it. Thus the game gets 5 dazzling gems out of a possible 5.